Iraqi's new Prime Minister Nouri Maliki has been quick to throw the spotlight on the handover of security from the multinational forces to Iraqi personnel. Mr Maliki has announced that the handover will begin in July, with the British-controlled province of Muthanna in the south transferring to Iraqi forces. He has said that 16 of 18 provinces will be in Iraqi hands by the end of the year. This is far quicker than any previous US and UK estimates. Some analysts have suggested a major foreign troop presence of 10 years. 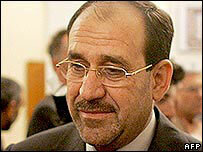 Achieving his ambitious timetable could be the key to the success of Mr Maliki's government. Still, the factors that will determine the timing of troop reductions or withdrawal remain complex and fluid. How could they combine to meet Mr Maliki's schedule? Or to destroy it? The new administration maintains a balance between Shia, Sunni and Kurdish aspirations and succeeds in fostering the "Iraqi-sation" the US and UK governments hope for. A deal is agreed on the contentious issue of who takes the temporarily unfilled posts of interior minister and defence minister. Mr Maliki has started with confidence - but is it misplaced? A Shia gets the former, controlling the police, and a Sunni the latter, controlling the army. Efforts begin to succeed in bringing sectarian militia into the mainstream security forces. 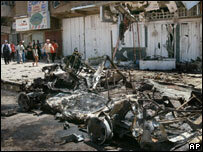 Sectarian killings decline, creating a greater sense of security, particularly in Baghdad. The initial handover to Iraqi forces of the southern provinces of Muthanna and Misan goes as well as expected and others begin to transfer. Sunni insurgents take note of the desire of the UK and US to leave and join talks with the multinational forces - as suggested this week by Sunni Arab Vice President Tariq Hashimi. Militant violence is contained. The Iraqi administration presses ahead with its plans to increase security forces from 253,000 to 325,000 by December and despite equipment and training problems the force is largely ready to take over security by itself. The timetable set by the Pentagon of handing over half the 110 US operating bases to Iraqi forces by this July, and almost all by July 2007, is also realised. President Bush is able to reduce US troops from 133,000 to 100,000 by the end of this year, boosting his standing in time for November's mid-term elections. Mr Blair brings home 3,000 of the 8,000 British troops by December, taking a step to ensuring his legacy is not blackened by the Iraq War. Mr Maliki's hope of Iraqis controlling all provinces bar Baghdad and Anbar by the end of the year is, if not fully realised, then at least largely achieved. A US official returning from Baghdad with Defence Secretary Donald Rumsfeld last month admitted that the government of Nouri Maliki would be the last throw of the dice. But in this scenario, the game is lost. Squabbling continues over unfilled posts, huge divisions arise in the administration, the Sunnis walk out. Insurgents target the new administration in a huge show of strength. Mr Maliki's vow to use "maximum force" to "put an end to the militias" fails. The sectarian strife that has increased since the attack on the Shia shrine in the town of Samarra in February descends into all-out civil war. Sunni politicians repeat claims that Shia death squads operating within the police are behind sectarian killings. The end-of-year deadline to create the 325,000-strong security force is not met. A recent report by a retired American general suggesting it would take at least two to five more years of US support before the Iraqi army can stand and fight on its own now appears far more valid. The handover of Muthanna does not create a snowball. Misan highlights the complex problem of Iraqi security. It is not only insurgents and militias contributing to the breakdown of law and order but also mafia-style criminal gangs. The failure of the politicians leaves Mr Bush's promotion of Iraq as a democracy looking unfulfilled. The Kurds gain control of the oil-rich city of Kirkuk. The Sunni nightmare scenario of being left with a rump western region of sand and olive groves while the Kurds and Shias divide up the oil-rich north and south moves closer to reality. Far from reducing troops the US and the UK are forced to commit them on an indefinite basis.